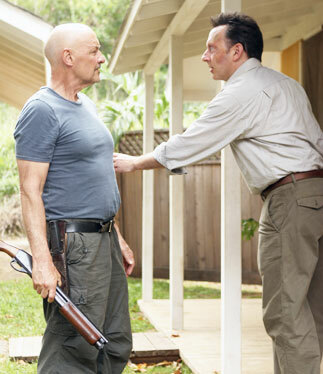 Locke (Terry O'Quinn) indulges in psychological battle with Ben (Michael Emerson) in the Others' homestead. Both earned Emmy nominations last year in the category of Best Supporting Actor. Few will argue the depth of Michael Emerson's talent. But the versatile actor -- whose stage credits outweigh his television and feature film experience -- says the environment makes his job easier. "No acting required when you're standing in a 40-mile-an-hour gale at Makapuu," he says, chuckling. "You lean into the wind, you hope you don't fall. There's stinging rain or the crashing surf behind you. You have to yell. It's just sort of there. Because if you were doing a play, you would have to enact all of that stuff." Thursday's new episode of "Lost" features the charming and chilling Ben Linus, and could yield another Emmy Award nomination for Emerson in the category of supporting actor. It's a big deal, to be sure. But Emerson, who won an Emmy in 2001 for a guest-starring role on "The Practice," and earned a nomination last year for best supporting actor on "Lost" (the award went to cast-mate and fellow nominee Terry O'Quinn), maintains his perspective. "The Academy of Television Arts and Sciences asks actors to submit what they consider to be their best or most representative episode," he explains. "Like other actors, I look for an episode where I have a fair amount of screen time, some special moments and a range of tone and color. For an actor on 'Lost,' the natural choice is the episode that is dedicated to your character -- traditionally, we each have one in the course of a season. In my case the episode hadn't been filmed when submissions were due, but I was convinced, based on the strength of the script, that this was the one to enter. So a person submits, and then a person goes on with the business at hand."